The 1917 Indian Powerplus Motorcycle for sale is a classic, a truly excellent, Indian motorcycle that has been fully and completely restored to perfection. No expense was spared on the restoration that took all of three years to complete. Each and every part and piece was disassembled, smoothed and re-installed to perfection. Go here to see more old Indian motorcycles for sale and you will quickly see that this one is head and shoulders ahead of the rest! We computer matched the paint color using a sample from the area under the tool box latch that had been protected from sunlight. 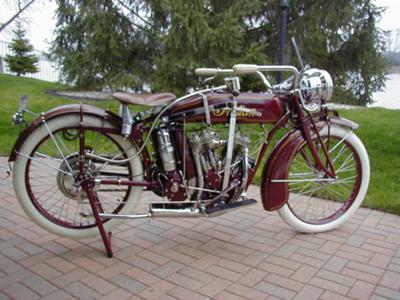 This antique Indian is the best of the best and is truly a work of art. The old bike retains the original gas head, tail-lights, a correct M-2 Dixie magneto, a rare optioned Corbin Brown speedometer and even has a rare Ohio title. Needless to say this 1917 Indian Powerplus Motorcycle for Sale is not cheap and is best suited for the man who can afford rare toys (Jay Leno comes to mind) and wants only the very best in his collection. 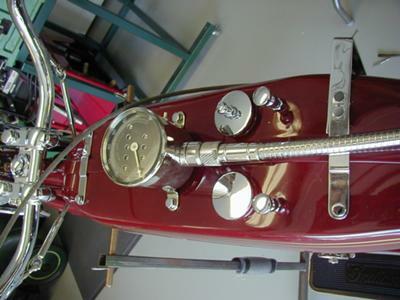 1917 was the second year for Indian to use the new Powerplus motor and was the very first year for the gas tank to be located over the frame rails rather than in between them. and lift the valves to stop the engine. The next year, in 1918, Indian began to use cables. For get more information on the antique Indian Motorcycle for Sale or to request pictures please sale contact me by e-mailing me your questions and offers using the space below that has been provided by GoGoCycles Old Indian Motorcycles for Sale (and PLEASE do not neglect to include your contact information in your email or to provide a phone number or email address!) so that I can respond with answers to your questions or after consideration of your best offer as quickly as possible. 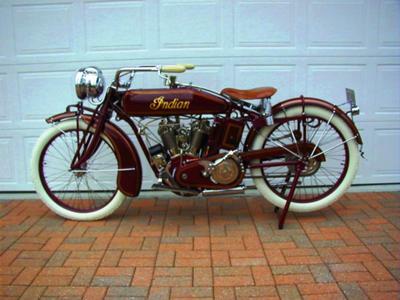 You won't find more beautifully restored 1917 Indian motorcycle for sale in Ohio, on Craigslist or in an Ebay auction so hurry and make an offer before it gets away from you! GoGoCycles would also encourage bikers to submit a review of the 1917 Indian Powerplus Motorcycle for Sale to make the biker community aware of any problems that are commonly associated with this very old Indian motorcycle for sale or to highlight its positive features and help potential buyers make informed decisions. This vintage motorcycle for sale is located in OH Ohio and my asking price is $56,500. THIS Indian Power Plus IS NO LONGER FOR SALE ! right here on www.gogocycles.com so don't leave before you take a look to see what's available! The bike was amazingly restored except much of it was chrome plated rather than the proper nickel plate as should be. I should know as it cost me $5,000 to have the parts reversed to proper nickel after I bought the bike. I do love it and it is the best of my collection.